I am very excited to share with you how to hand turn a wood bracelet. I understand that not everyone will have the tools to do this, but maybe some of you do or know someone who does. You will need a lathe or midi-lathe in order to do this project. My husband and I purchased ours off of a local shop teacher that was laid off. So many high schools are closing down their wood shops (insert super sad face here), and many of the teachers are given the tools to do with what they please. Yay for Craigslist! We also took a class on pen turning and bowl turning at our local Woodcraft store to get the basics skills needed to use our midi-lathe. 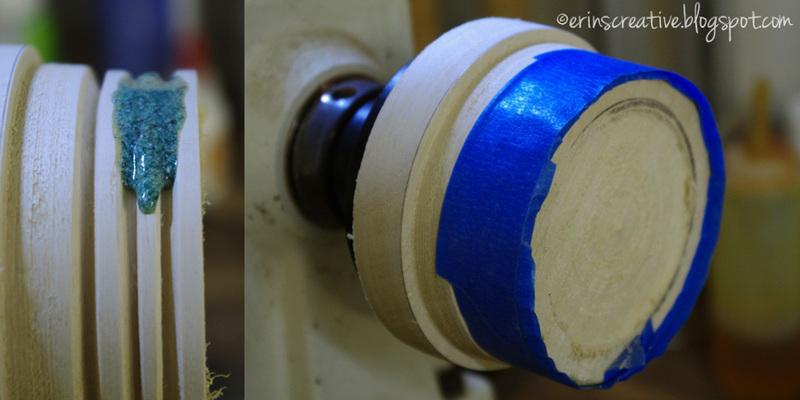 Please do NOT attempt wood turning without taking a basic class and reading the instruction manual for your lathe. 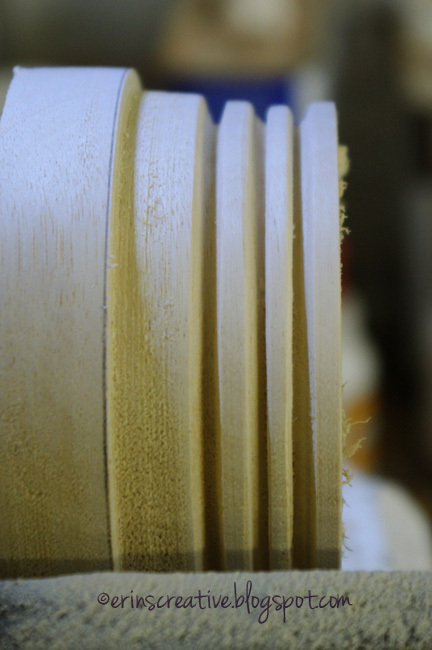 Please wear your protective safety gear when wood turning. I do NOT want anyone to hurt themselves. As with any power tools, there are risks associated with it’s use. 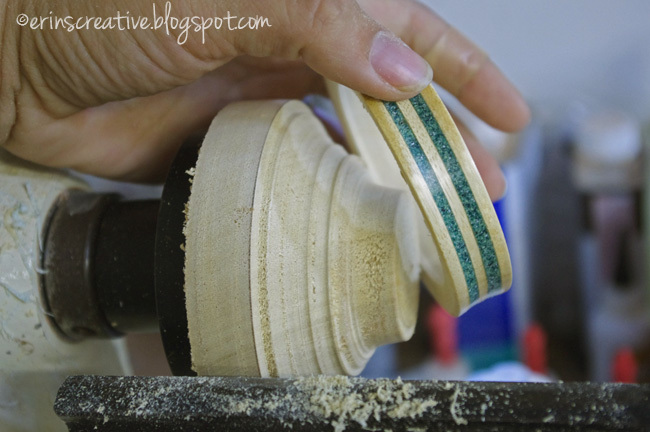 On top of needing a lathe, you will also need turning tools, a block of wood, InLace, sandpaper, sanding sealer and finishing wax. 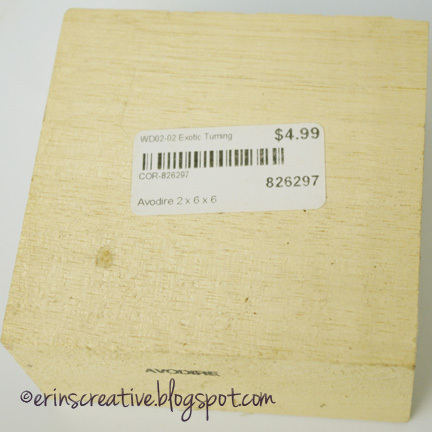 I picked up a block of avodire wood from my local woodcraft store. Avodire is a lighweight tropical wood from Africa. You could easily find other woods to turn with, this just happened to be light in color and a very light (weight) wood. It’s what I was looking for. 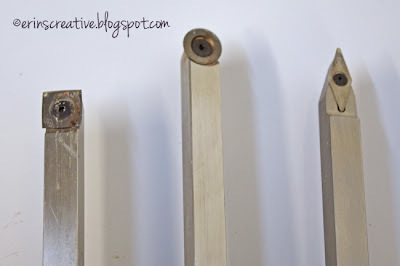 Find the center of your wood by drawing an “X” from corner to corner. 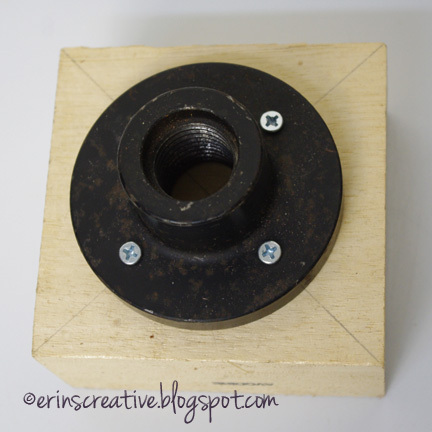 You will need this when mounting your chuck. Line up the “X” in the center of the chuck and screw it into place. Use screws long enough to get a good hold on the wood, but not so long that you will hit them when turning the wood. 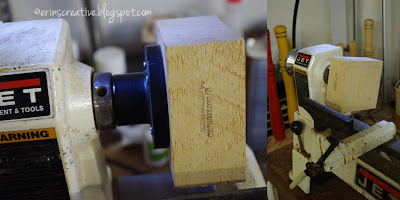 Then mount your wood on the lathe by screwing your chuck on. Next, you will need some turning tools. 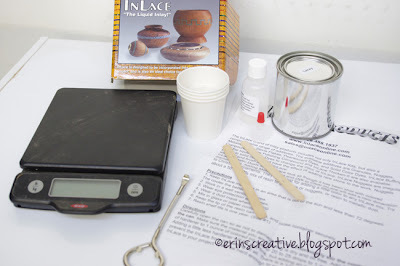 I use a set of Easy Wood Tools. These are not the traditional tools usually found for wood turning, but they work wonderfully and are my tools of choice. Next, use the rougher to turn your wood round as shown. I set my lathe to turn at about 1200-1400 rpms. 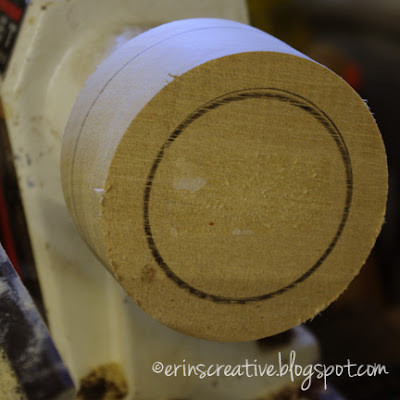 I then marked my wood for the bracelet’s inner diameter of 2 5/8 of an inch. I used a bangle bracelet that I already owned that fit perfectly and used that as a reference for deciding on that size. diameter of my bracelet, approximately 3 1/4 inches. I then cut my grooves in the bracelet with the Easy Detailer. I stopped turning the wood at this point and pulled out my InLace kit. I used the kit Lacey. It had an epoxy mixture that contained a synthetic crushed green stone. I next measured out the amount I was going to use and added the appropriate amount of hardener to the mix, stirred it up and started applying it into the grooves. Because it is round, you need to do something to keep the InLace from falling out. I used blue painters tape to hold it in place. 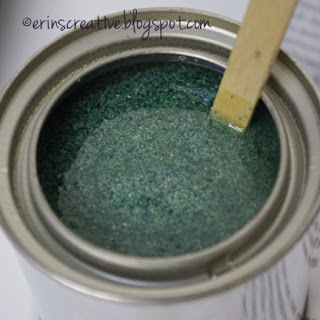 Apply a small amount, add tape, then turn, repeat until you have filled the grooves completely, being careful not to create air bubbles while applying the mixture. I let it cure for a few hours and then used the Easy Finisher to turn off the excess InLace and give my bracelet a concave curve. I also used the detailer to mark the edge of my bracelet and turn that down to get ready to remove it from the block of wood. 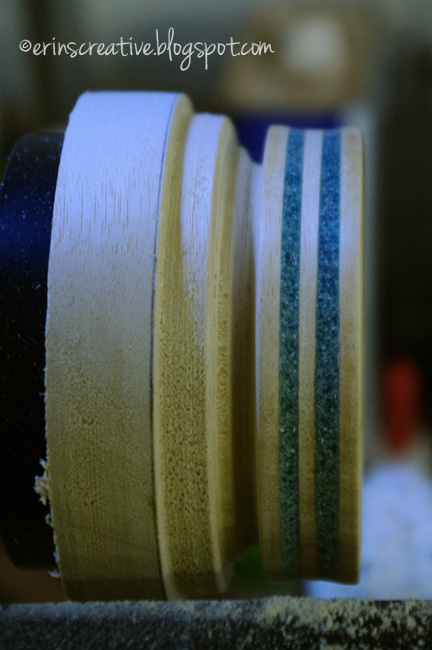 I then sanded and the sides and outer edge of the bracelet starting with 150 grit sandpaper, working my way up to 600 grit. 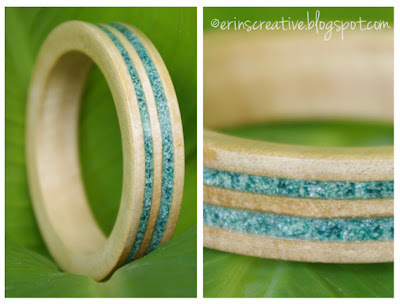 I then applied a sanding sealer to my bracelet. After those steps I started turning out the center of the bracelet. I brought it very close to the cut edge seen above until I could shine a light and see it through the wood. This is how I knew I was very close. I then returned to the side of the bracelet and with the detailer tool in one hand and my other hand ready to catch the bracelet when it released. If you are not comfortable doing it this way, employ the help of a friend or spouse to be at the ready to grab the bracelet when you release it. 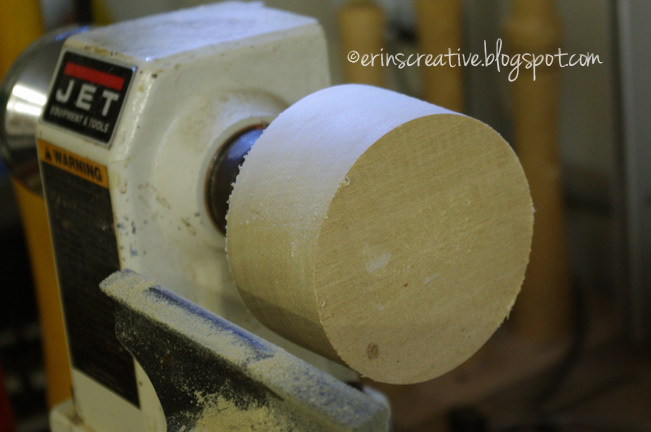 The last thing you want to happen is it it fly of the lathe and smash into pieces on impact. Then follow the same steps to finish the inside of the bracelet that you did on the outside. 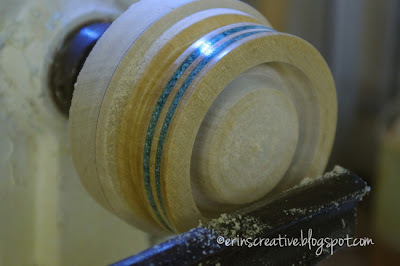 It will take longer because you have to hand sand without the assistance of the lathe. Once that is done, apply a wax finish. My husband and I love Renaissance Wax. A little of that stuff goes a long way! Once complete, wear it with pride and smile every time someone asks you where you bought it. 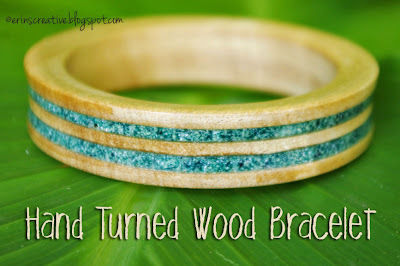 I loved how this bracelet looks, but I know not everyone can make it – there are other ways to achieve a similar look – congrats for making such a pretty bracelet – I love everything that sparkles when it come to jewelry.